Using pneumatic pistons and servos to power robots makes them fast and strong, but also bulky and extremely heavy. No one is going to mistake ATLAS for a real human being. To eventually create humanoid-looking robots like the Terminator we need to mechanically replicate every part of the human anatomy—starting with the muscles. 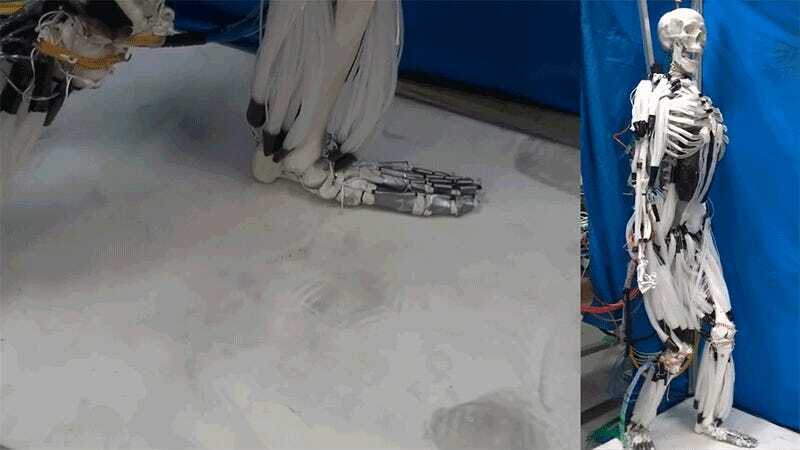 The robot’s legs actually contain the same number of muscles that a real human being’s legs use to walk, but the Suzumori Endo humanoid can’t go for a stroll just yet without additional support. The artificial muscles are still considerably slower than the biological versions that inspired them, making self-balance all but impossible at this stage. But eventually the technology will be improved so that Skynet will eventually having no problem infiltrating and wiping out humanity using Terminators.